The warm colors of a sunrise or sunset in a wide open landscape, the foreground gently touched by the orange hues, and the sun throwing a nice aperture star—that is what the romanticizing cliché of landscape photography looks like in the heads of many people these days I reckon. Rightfully so, since it is one of the most atmospheric times of day to shoot: the light is soft, and partial illumination of the foreground is desirable for tonal separation and visual flow. Almost every landscape photographer has at some point of his or her creative journey chased the intensity that comes with the golden hour. Still, even after all these years of shooting mainly landscapes, going after the elusive sunset and sunrise light is one of my favorite things to do while out in the field. One of the reasons is simply because depending on where you live it can be a rare sight—it is not an everyday sight for most of us. Whenever I am out on a road trip or hiking trip I keep a constant eye on the satellite data—if I have cell reception—to check the cloud coverage in order to find spots right at the edge of a field of clouds to get good conditions for a sunrise or sunset shot. To take this shot, I took a look at the radar over the western parts of Ireland—over the Burren National Park to be exact—and monitored the satellite forecast before I was catching some shuteye. The predictions for the following morning showed the clouds would most likely pass in the next couple of hours, being carried further north, leaving only a field of scattered patches behind. Furthermore, there would be no clouds at the eastern horizon blocking the sunlight. It is not hard to do these sorts of things if you know the sources for reliable weather data in the area you’re in, but it can be the difference between getting a good shot or none at all. So, for all who don’t do this already I would highly recommend using satellite and radar data to scout your location ahead of time. When I woke up next morning it was still dark as I made my way out to the karst landscape of the national park grounds which are dominated by limestone ground speckled with shrubs and grass. I had scouted the lake before while I was preparing for my trip by looking at hiking maps of the area, and knew the sun was at the right angle to rise next to one of the limestone hills I had hiked to a day before. With this in mind, I was spending much of the blue hour finding different foreground compositions for the moment the clouds would light up and sun would make its way past the horizon line. Originally, I intended to include a bigger patch of the lake in my image, but ultimately scrapped the idea for the shrubs and stones for three reasons: A) because the unique feature of the landscape is not the lake but rather the limestone, B) because the clouds were almost entirely gone by the time the sun rose and only covered a narrow strip of the sky, logically much of the reflection would have been just empty sky, and C) the morning light on the shrubs made for a warm and cold color palette with the rocks still in the shade. I tried to balance out the double sun star in the upper right corner by placing some of the little bushes near the lower left corner of the frame. Due to the perspective, the gaps in between the shrubs appear to becoming shorter the further away they are from the camera, creating a visual flow and implicitly drawing the viewer into the image towards the sun, much like the curvature of the shoreline and the slim layer of mist above the lake. To me the leading lines were appealing in their subtlety, not being too obvious, yet present. After I walked back to my sleeping bag I was very content, feeling like I did the landscape and the sunrise justice. This was also one of the last shots I took on my two week road trip through Ireland and it seemed like the country had saved the best light for last. Now I have another cheesy sunset in my portfolio. 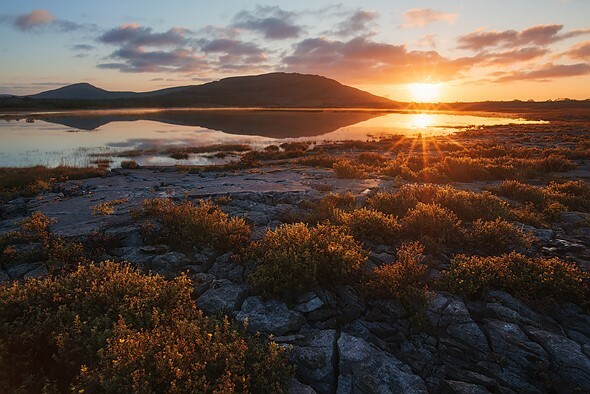 And sure, for some it may be nothing more than a cliché, but for me it represents a morning alone in Burren National Park, one of the most beautiful areas of Ireland, sitting in the warm morning light and enjoying these sights and taking a couple of shots while eating breakfast—pure bliss for a landscape photographer.